The saga begins as two team members, the mad scientists, hastily depart from the undisclosed New Orleans laboratory in a 2015 Dodge Challenger at ludicrous speed to St. Louis where they rendezvoused with the Master Villain and his sinister sidekicks Driving Kitty and Bari-Gary. Upon arrival, all of the important equipment and additional accoutrement were transferred to an 2016 Ford Flex Limited EchoBoost AWD, including a cargo carrier attached to a trailer hitch receiver. After a Systems Check, and a clearance for departure was granted by the wives of the team members, they proceeded at warp 12 to Allentown, PA, where they recharged their warp coils at the local Red Roof Inn, and refilled the antimatter pods at the Queens City Diner the next morning. As we had had pushed the warp drive to the limit the night before, we were able to roll into New York City at a more leisurely pace, and when traffic was (slightly) less intense. Master Villain used his expert driving skills to navigate from New Jersey through the Lincoln Tunnel into the heart of the City. As we approached, I saw the skyline had changed since my last visit. Tears welled in my eyes. No words can describe what I felt at that moment. One of the mad scientists, the author of this tale, had taken the journey before, but not since 1985. 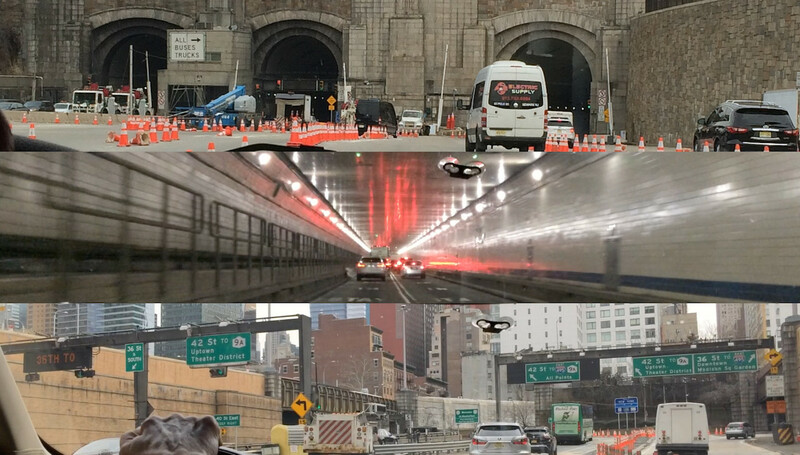 I had been through the Lincoln Tunnel several times as a child during the 1960s and 1970s, as my grandparents and father are natives of Manhattan - for me it felt like returning to my second home. I was born and raised in New Orleans, but I am also from New York, and feel connected to this magnificent city. The last time I visited and viewed the City from above, it was from atop the World Trade Center. This time it was from the Empire State Building, which I had not entered since I was, perhaps, 13 years old. 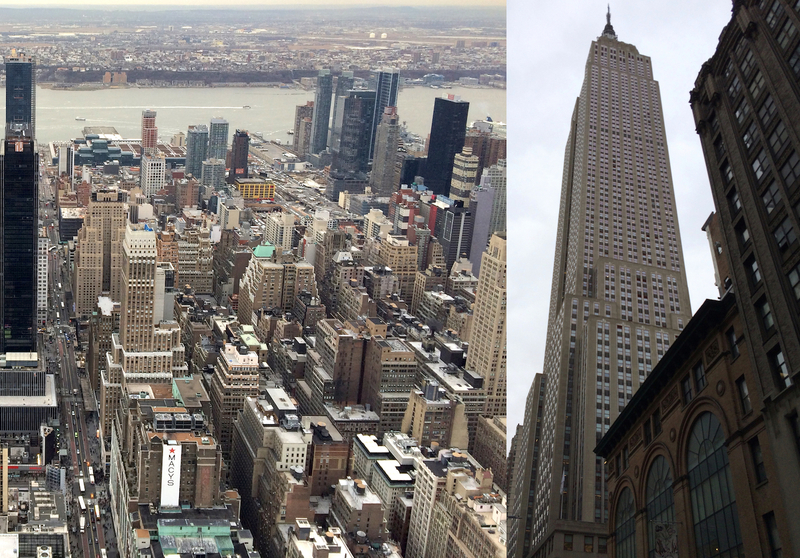 From this vantage point, the Car Chat team was able to see many iconic buildings, like the majestic Chrysler Building, five boroughs, parks, and neighboring states. Looking toward the Hudson River, we could see our destination, the Jacob Javits Convention Center, where the 2018 New York International Auto Show is currently being held. After our our birds-eye view of the City, a side trip which was likely driven by Driving Kitty's feline nature and need to look down upon his potential prey, we ventured toward the Javits Center on foot, carrying our press kits and lugging our photography equipment. We came upon many interesting sights and smells along the way, some pleasant, some not so pleasant. I chuckled when I walked passed a NYC Metro Transit Police Smart ForTwo wondering how any normal-sized person could comfortably fit inside wearing tactical gear and still leave room for other important items (bagels with lox and cream cheese, and triple shot espresso). However, that reflects my decades-long diet of New Orleans Creole and Louisiana Cajun food. Those tiny cars are truly necessary in such tight spaces, and densely populated urban areas. The glass façade of the Javits Center impressed us as we approached our final destination. I have always liked buildings with lots of glass windows, even though they maybe be impractical in some situations, such as in areas prone to high winds and vulnerable to the impacts of tropical cyclones. Nevertheless, glass windows let in a lot of natural sunlight, which is good. It is a welcoming sight for any visitor. As a father of a five year old, I am happy to report the 2018 New York International Auto Show has something for everyone, and is a family-friendly event. There are entertaining virtual reality displays and games to play, and even lego work station sponsored by Ford that will encourage STEM-related creativity. 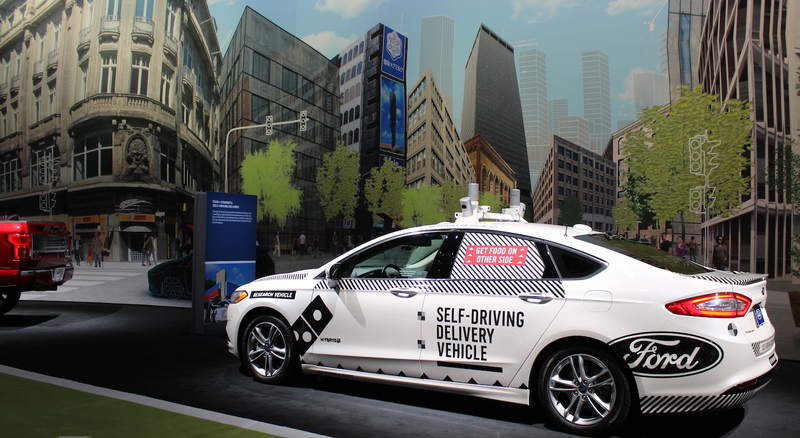 Near the Lego work station, Ford also provided a glimpse into the near future regarding autonomous, self-driving delivery vehicles as a service. Also on Level 3, Toyota has provided a driverless concept display and a virtual reality experience for two passengers - a really fun experience! It gives us a look into a very likely future, and had me wondering how soon this will happen. I imagined that my daughter would be traveling in a vehicle very much like it on her way to a future New York International Auto Show, and I could see myself as a grandfather in the back seat with a grandchild, completely unconcerned about driving -- perhaps this is a sign the 'back seat driver' may become an extinct phenomenon. In conclusion, this is a fun event for the whole family and all auto enthusiasts. It is definitely worth the effort to come to New York City for this event because you can organize so many other touristic activities around it, so many, in fact, that it goes way beyond the scope of this article to even mention them. The latest models and important highlights of the 2018 New York International Auto Show will be discussed by the Car Chat writers in subsequent articles. Lastly, as members of the press, we enjoyed our sneak peek, and truly appreciated the hospitality of the NYIAS organizers and staff. They provided a first-class service, and the same can be said of the Doubletree Hilton Times Square South staff as well, especially the awesome concierges Matt and Bruno who helped us with parking, and gave us hot cookies as we left the hotel. 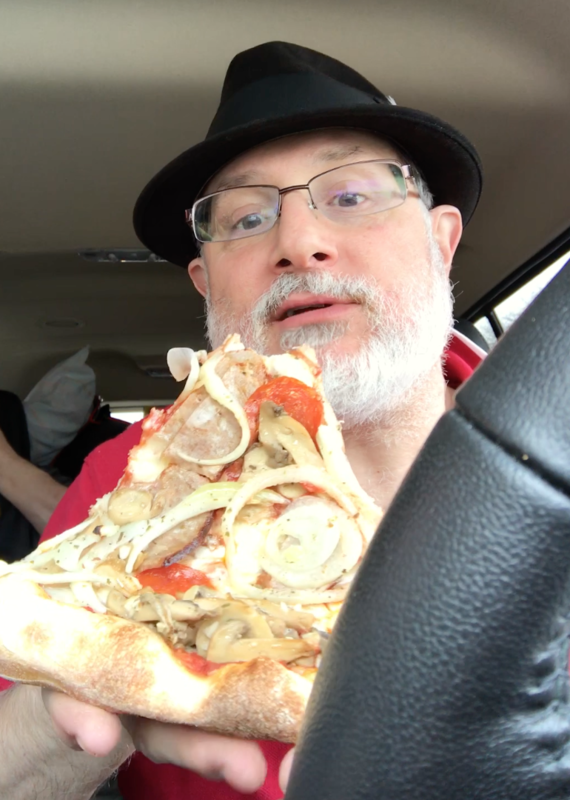 Oh, one last mission we had to accomplish before we left New York City: acquire world famous, New York-style thin crust pizza! However, we'll cover that offbeat story in a later article.